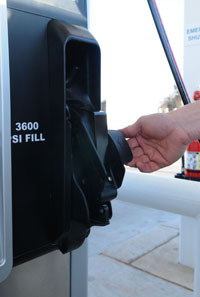 Remove the fill-up nozzle from the dispenser. Make sure the lever is turned counterclockwise before connecting. 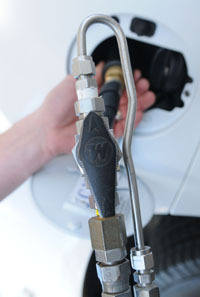 Connect the nozzle to the fitting on your vehicle and lock it in place by turning the lever clockwise. Swipe your credit or debit card. 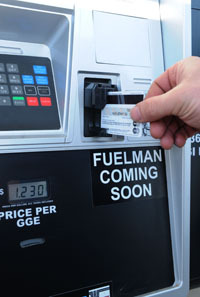 Once your card is approved, flip the lever up on the dispenser. You should hear the gas flow through the line. Read the electronic percentage gauge on the dispenser. 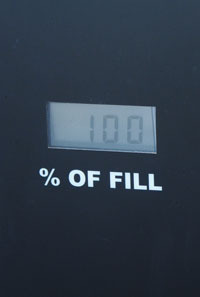 When it reaches 80 – 100%, it will automatically shut off. 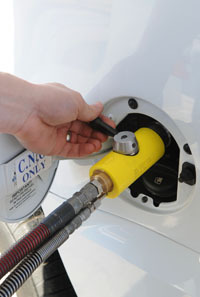 NOTE: Since the compressor is putting the gas into the vehicle under pressure, you will hear it cycle on and cycle off. This is normal as the system is gathering information on gas temperature and pressure. 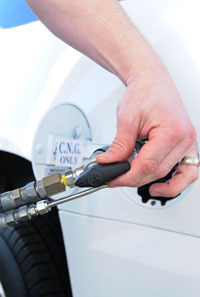 The compressor will continue to fill the vehicle until it is full. 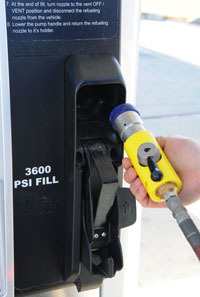 Disconnect the fill nozzle and return it to the dispenser. Congratulations! 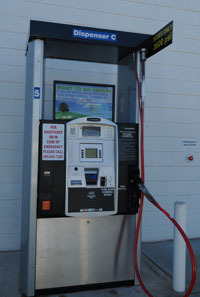 You’ve just filled up with an environmentally friendly fuel that is produced in America and supports our economy. 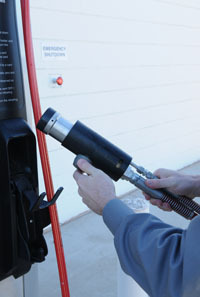 Remove the fill-up nozzle from the dispenser. NOTE: Make sure the lever on the flexible hose is turned clockwise before connecting. The arrows on the handle should point down in the “off position.” The hose should be easy to bend and attach. If it is pressurized, the hose will be firm and unwilling to bend. 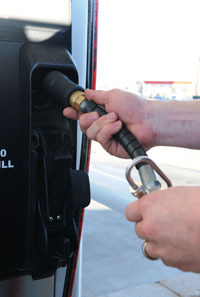 Connect the nozzle to your vehicle by pulling back the black sleeve on the nozzle and pushing it over the fitting on your vehicle. 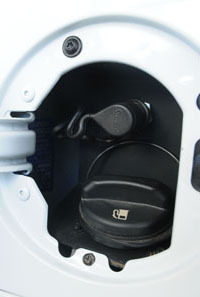 The nozzle will lock into place when a proper seal has been established. NOTE: You may have to remove the gasoline cap from your gasoline tank if the flex hose will not directly fit over your tank attachment. 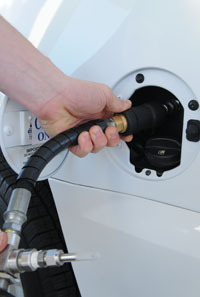 Once connected, turn the lever to pressurize the hose. This dispenser is made for large transit buses and large trucks only. All other vehicles will not hook up to this hose. 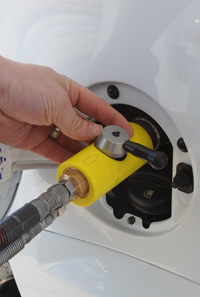 This station is equipped to deliver compressed natural gas (CNG) at 3,600 PSI and 3000 PSI. Review the dispenser listing for pressure at the top of each unit. 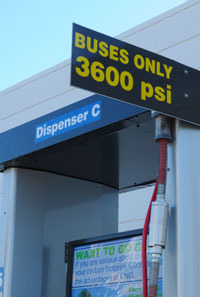 A sign will read 3600 or 3000 PSI for the proper designation. If your vehicle is not rated to accept CNG at this pressure, do not fill up at this station. Doing so could result in serious injury. 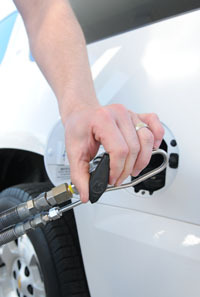 You can tell the rating of your vehicle by checking inside the fuel fill door on your vehicle or in your owner’s manual.